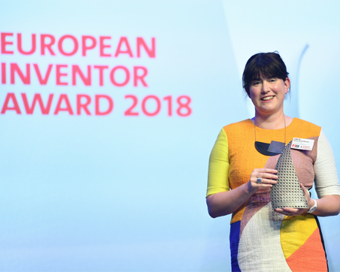 Irish inventor and entrepreneur Jane Ní Dhulchaointigh is winner of this year’s European Inventor Award. She is the first ever Irish inventor to receive the award since its first edition in 2006. The Kilkenny native received the award in the “Small and medium-sized enterprises (SMEs)” category at a ceremony in Paris, Saint-Germain-en-Laye, hosted by the European Patent Office (EPO) and attended by some 600 guests from the areas of politics, business, intellectual property and science. Ni Dhulchaointigh was recognised for her invention of Sugru, a malleable glue with both the adhesive properties of super glue and the pliability of rubber. Sugru, after the Irish word for ‘play’, is used around the world to successfully repair and personalise virtually any everyday item. The European Inventor Award is presented annually by the EPO to distinguish outstanding inventors from Europe and around the world who have made an exceptional contribution to social development, technological progress and economic growth. The winners were chosen by an independent international jury from more than 500 individuals and teams of inventors put forward for this year’s award. Jane Ní Dhulchaointigh is one of four women inventors being honoured with the 2018 Award, the highest number ever since it was launched in 2006.